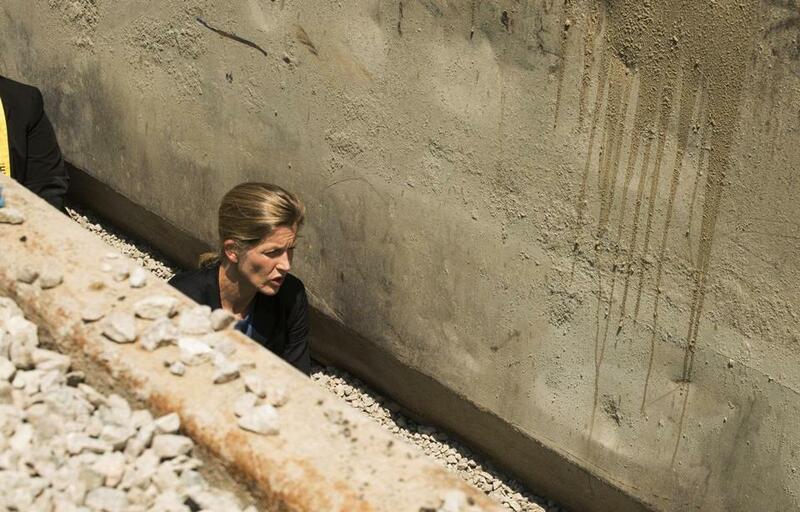 Karenna Gore protests at the site of Spectra Energy’s West Roxbury Lateral pipeline in Boston on June 29. Gore was among demonstrators who tried to block construction activity on the site by lying in a trench. On June 29, I was one of 23 people arrested for nonviolent resistance to a pipeline being built under the streets of West Roxbury. Owned by a Texas-based corporation called Spectra Energy, the West Roxbury Lateral would use high pressure to push fracked natural gas approximately 5 miles of a journey that begins in the Marcellus Shale in Pennsylvania. Spectra is expanding; this is part of its Algonquin Incremental Market plan to build 37 new miles of pipeline and six compressor stations in order to sell this fuel to markets in the Northeast and potentially for export. In order to avoid the worst effects of climate change, including flooding of coastal cities like Boston, we must accelerate the transition of our energy economy away from fossil fuels like natural gas, toward renewables like solar and wind. When a local community rejects new fossil fuel infrastructure, it ought to be enough. But the oil and gas industry is now an empire that makes its own rules. West Roxbury is a small but important part of the empire, a short but highly dangerous section of this pipeline route, carrying gas perilously close to a quarry where the pipe might be damaged and leak, or catch fire. Boston is one of the only large cities in America that still has an active open pit quarry (dating to 1887). Forcing local residents to live with a gas pipeline running underground right next to a place where rocks are regularly blown up with dynamite illustrates the perversity of the power at work here. That particular flaw of the West Roxbury project underscores the problem. Local families feel voiceless. It does not seem to matter that all community elected officials are opposed to this pipeline, or that the city of Boston is actively litigating against it. So far, Spectra has been able to easily overcome these inconveniences through lobbying and influence peddling. The federal agency meant to oversee pipeline construction is actually part of the problem, and Congress has given it the power to overrule local governments and affected communities. The Federal Energy Regulatory Commission approved this pipeline in Washington, D.C., after closed-door meetings between FERC commissioners and a trade group lobbying on behalf of Spectra. This same trade group lobbied to secure reappointment by the US Senate of at least one of the FERC commissioners with whom the company was meeting. Pipeline proponents rely on an outdated and flawed argument: Even though fracking can cause local environmental problems such as water contamination and earthquakes, it is nevertheless warranted because we need energy and burning this type of fuel releases only half the carbon emissions as does the burning of coal. They overlook the fact that the earth’s atmosphere is already overloaded with heat-trapping carbon pollution. They neglect to consider the costs of locking in another generation to pipelines, fossil fuels, and insider deals. What is called “natural” gas is composed mostly of methane. The process of extracting and transporting it is highly prone to leakage, which a recent Harvard study found is already occurring in the Boston area at a rate two to three times higher than previous government estimates. Climate scientists now know that methane traps much more heat in the atmosphere than previously thought — it is up to 84 times more heat trapping than carbon dioxide over a 20-year period. All of this makes it imperative to stop using natural gas as a “bridge fuel.” It is more like a walk-the-plank fuel. There are now zero carbon alternatives to fossil fuels that can supply all of our energy needs — particularly if we devote the same political will to developing them that we have devoted for so long to propping up the fossil fuel industry. Our energy policy should follow common sense: When you are in a hole, stop digging. Climate disruption is already claiming many lives. Just before our nonviolent civil disobedience — led by the community group Resist the Pipeline — Harvard Divinity student Tim DeChristopher pointed out how similar the gas trench in West Roxbury looked to the mass grave that was recently dug in Pakistan in anticipation of the lethal heat waves that have worsened in recent years. In 2015, roughly 2,000 Pakistanis died as temperatures soared to 120 degrees. We lay in the trench with that connection in mind. Our energy choices have life-and-death consequences. The Rev. Mariama White-Hammond, born and raised in Boston, invoked the words of Dr. Martin Luther King Jr. as she eulogized the people dying from the effects of climate change in cultures that consume far less than ours. King was famously jailed for resisting a government that was actively infringing on human rights, and his “Letter from Birmingham Jail” is now recognized as one of the greatest arguments ever written about civic responsibility and the “inescapable network of mutuality” that binds us together. In Massachusetts, there is also a strong tradition of resistance. In his essay on civil disobedience, written after a night in jail on July 23, 1846, Henry David Thoreau put forth the notion that when the law itself requires us to be agents of injustice, it is right to peacefully disobey. “We should be men first, and subjects afterward,” he wrote. Surely this is all the more true when the law requiring us to abet injustice is written behind closed doors under the powerful, hidden influence of a corporation pursuing profit at the expense of the future of humankind. In West Roxbury, these powerful forces — corporate power and civic responsibility — have now collided. Karenna Gore is the director of the Center for Earth Ethics at Union Theological Seminary.